Sometimes it’s good to take a step back and really examine your daily habits. Are you spinning your wheels doing things that aren’t absolutely necessary? 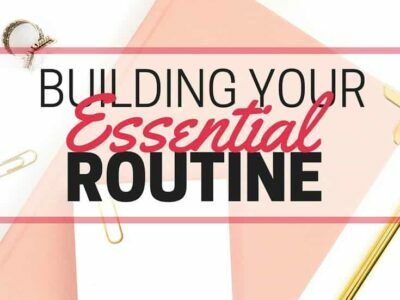 If so, it’s time to build your essential routine. Is anyone else just feeling totally overwhelmed by all of the stuff that needs to be done? I don’t know what it is, but the end-of-school season is giving me a major case of senioritis. It’s like we’ve all been pushed to the limit, and school just needs to be OVER. Unfortunately, we still have a good three weeks of school left. My feelings of senioritis have made me really start to look at what’s essential to keep everything running semi-smoothly. I cut out a lot of things, and figured out ways to simplify what was already a fairly simple routine. After a week of being on my essential routine, I’m convinced (again) that easier is better. Write down all of the stuff you have to do on a regular basis. Seriously, write down everything. Driving, packing lunches, cleaning, grocery shopping, getting gas in the car – it all takes time. Write down the stuff you’re not doing that you really need to be doing. I had to write down things like picking up the mail, going on a walk (for exercise), and sweeping the kitchen floor. 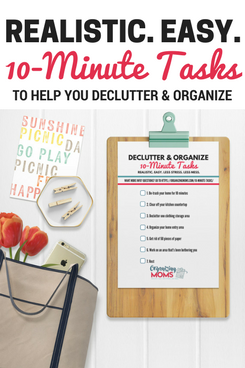 Look at your list, and start getting rid of stuff. If it’s not essential, get rid of it. When you’re super-tired, look at the list again and get rid of more stuff. Exhaustion can help you find the unnecessary in your schedule. Group like-items together. Maybe you can consolidate all of your errands into one trip. When you come home from a walk or a run, you can swing by the mailbox and pick up your mail before heading home. Automate all that you can. Here’s five ways you can automate your errands. Now, look at your list, and see if you can find someone else to do some things for you. My five-year-olds are now responsible for sweeping our kitchen floor. It’s not done perfectly, but they love to use the little vacuum, they’re learning, and I don’t have to stress about the how I procrastinate in cleaning up the continual accumulation of Cheerio crumbs on the floor. If you’re really in a tough position, consider paying someone to help you. This week my back has been in terrible shape, and I’ve been to the doctor a couple of times for it. Meanwhile, our house is filthy. I found a cleaning service that was willing to come in and clean just our bathrooms and kitchen (for a lower price than cleaning the whole house), and I was able to cross “cleaning” off the list for a week while my back recovers. I used part of my earnings from selling old clothes on ThredUp to pay for it. Chart out your new essential routine. 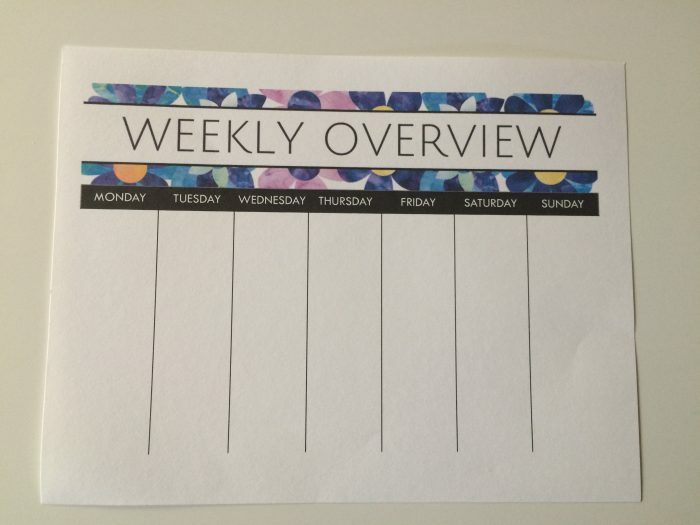 I used a 7-day calendar, and I wrote in all of the stuff that needed to get done, and spread it out over the course of a week. I factored in activities, driving time, and how much energy I anticipated having on certain days. 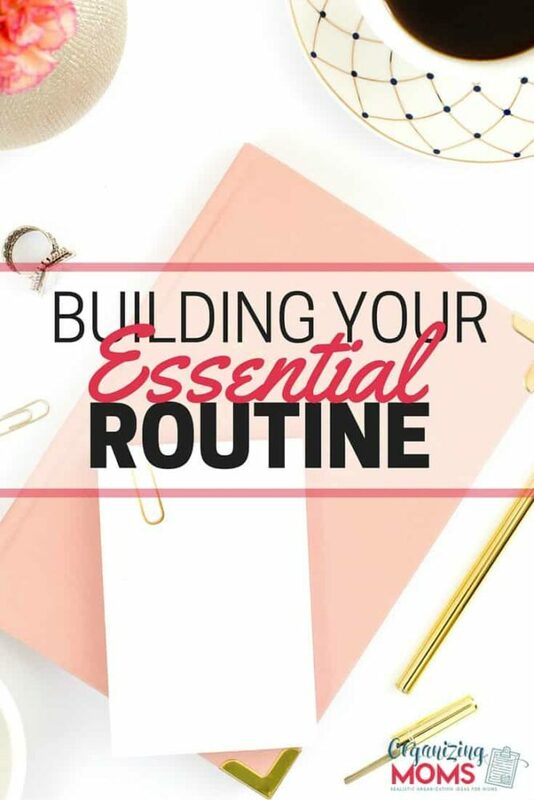 On days when I work, I tried to make my home routine a little easier. Make yourself an essential routine to-do list. This is what I’ve been using to help keep myself on track. To make the routine less overwhelming, I didn’t add in the stuff I would never be able to forget to do (like drive kids to school, make breakfast, etc.). I did add stuff I would put off (laundry, meal prep, calling to make appointments, etc.). Follow your new routine. Even if it seems silly. Some days our kitchen isn’t very dirty (okay, this only happens if don’t eat at home). On those days, I’m tempted not to follow through with the routine of cleaning up the kitchen and running the dishwasher. But, by sticking to it, things don’t get out of control as easily, and I feel like I’m accomplishing more, even though I might be doing less. Resist the temptation to add new stuff to your routine. Keep it simple. Protect your time. What goes in your essential routine? What can you cut out? Let us know about it in the comments!